Iraqi militias fighting Islamic State alongside government troops are using weapons - supplied by major military powers - to commit war crimes, stage revenge attacks and commit other atrocities, according to a new Amnesty International report. “International arms suppliers, including the USA, European countries, Russia and Iran, must wake up to the fact that all arms transfers to Iraq carry a real risk of ending up in the hands of militia groups with long histories of human rights violations,” said Patrick Wilcken, Amnesty International’s researcher on arms control and human rights. The report, entitled ‘Turning a blind eye: The arming of the Popular Mobilization Units’, comes as Iraqi troops and allied Shia militia units attempt to re-capture the Islamic State’s (IS, formerly ISIS/ISIL) stronghold of Mosul. Securing the large and heavily fortified city has proved difficult due to the terror group’s resistance and firepower. Iraqi forces have also been involved in cases of abuse, torture and extrajudicial killings, according to previous media reports. The weapons come from various countries, with the US the main supplier of military equipment to Iraqi forces. Since 2014, under the umbrella of the Iraq Train and Equip Fund (ITEF), about $1.6 billion of weapons have been brought into Iraq. the arsenal includes 38,400 M4 rifles, 1,560 M240 machine guns and 584,120, 81mm and 60mm mortars. Armed groups have also used heavy armored vehicles, including tanks in human rights violations, the Amnesty report said. AI referred to Kataib Hizbullah, a group believed to have committed “extrajudicial executions and other unlawful killings, in the context of the operation to retake Falluja.” The group reportedly used a range of US-manufactured military vehicles including an M1 Abrams tank, M113 armored personnel carriers, Humvees, and Mine-Resistant Ambush Protected vehicles (MRAP). Notably, the US Department of State declared Kataib Hizbullah a foreign terrorist organization on 2 July 2009. Some major NATO countries have also supplied arms to Iraq, according to the report. Germany provided 5,005 assault rifles, ten light machine guns as well as 243 portable anti-tank missile launchers and rocket systems. Italy sent 35,000 revolvers and self-loading pistols, while South Korea, the US’s Asian ally, sent $79 million worth of small arms ammunition and $47 million worth of rocket and grenade launchers. Russia is listed by Amnesty as the second largest supplies of arms to Iraq, having signed a $4.2 billion defense contract with the country’s government in 2012. According to Defense Industry Daily, the deal includes attack helicopters, fighter aircraft, air defense systems and armored vehicles. The London-based organization said that ‘Asa’ib Ahl al-Haq militia, which is blamed for abductions, killings and torture of Sunni men and boys, was spotted using Russian-made Orsis T-5000 rifles in 2014. Iran directly supports various Shia fighters in Iraq, including such groups as or Badr Brigades and ‘Asa’ib Ahl al-Haq, Amnesty stressed. The militiamen received Iranian rifles, anti-materiel guns, mortars and light vehicles in the form of sales and gifts, it added. “Any state selling arms to Iraq has to show that there are strict measures in place to make sure the weapons will not be used by paramilitary militias to flagrantly violate rights. If they haven’t done that, no transfer should take place,” Amnesty warned. 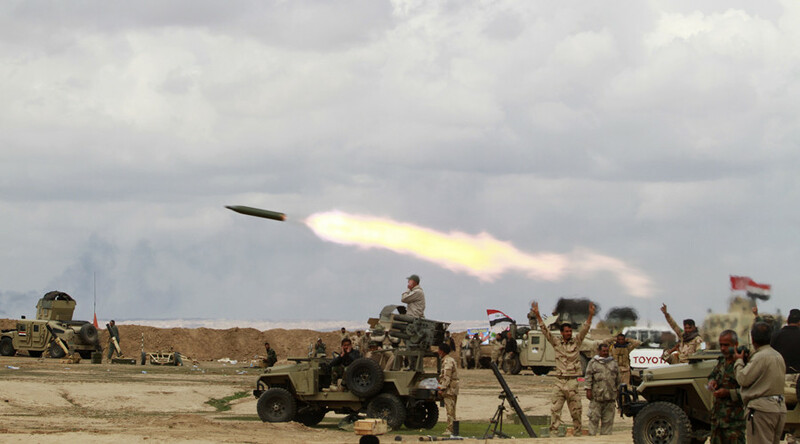 Iraqi authorities, for their part, “must put in place strict measures to ensure stockpiles of weapons are properly secured and monitored,” the rights group urged.